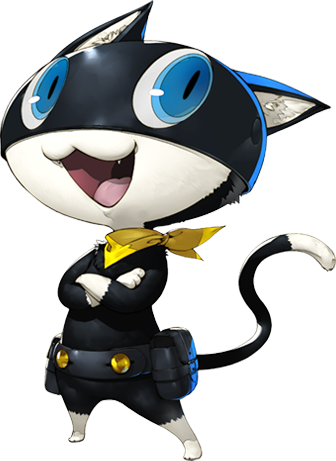 Morgana is a cat-like being that joins the protagonist on his heists. He can shapeshift into a variety of things that can be useful to the party. Morgana is a cat who wishes to become human. He takes any comments of simply being a cat as an attack on his individuality. Despite it being his predominant form, Morgana gets irritated when someone calls him a cat. Despite the feminine name, he is, in fact, a boy. He constantly attempts to act rather masculine which leads to his Persona’s masculine appearance. While he attempts to appear extremely bold and daring, Morgana, in reality, is quite insecure. Morgana dreads being abandoned or left alone. That insecurity comes out when Futaba Sakura reveals herself to be a more talented navigator than him. Succumbing to the jealousy, he temporarily leaves the Phantom Thieves to prove to them and himself that he doesn’t need them. However, this instead leads to him becoming Haru Okumura’s assistant. When they try to infiltrate Haru’s father’s palace, the plan backfires. Thus, he comes to his senses and apologizes to the Phantom Thieves. He vows to never let his ego or fears get in the way of their friendship again. Morgana tends to mew when he’s nervous or excited and can be a bit lacking in attention span. He quickly becomes distracted and spaced out when examining a Treasure for the first time. Though, he recovers fairly quickly. Morgana is a mysterious shapeshifting cat-like being who joins the protagonist in his heists. Morgana becomes interested in the protagonist and Ryuji Sakamoto after meeting them and decides to teach them about the Metaverse. He watches the protagonist and develops an interest in his power. However, he is unsure of his origins and seeks answers, though he is convinced he was a human at some point.